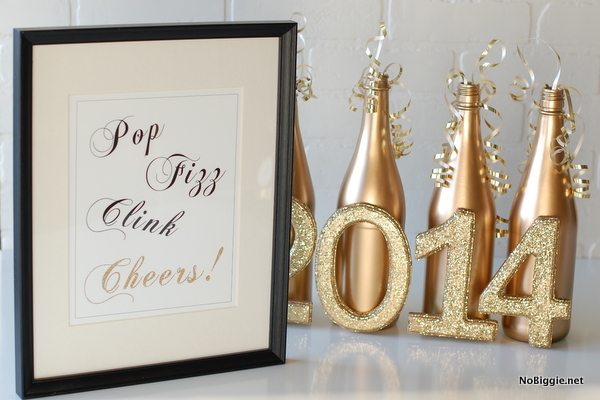 Frame up this cute print to celebrate the New Year! 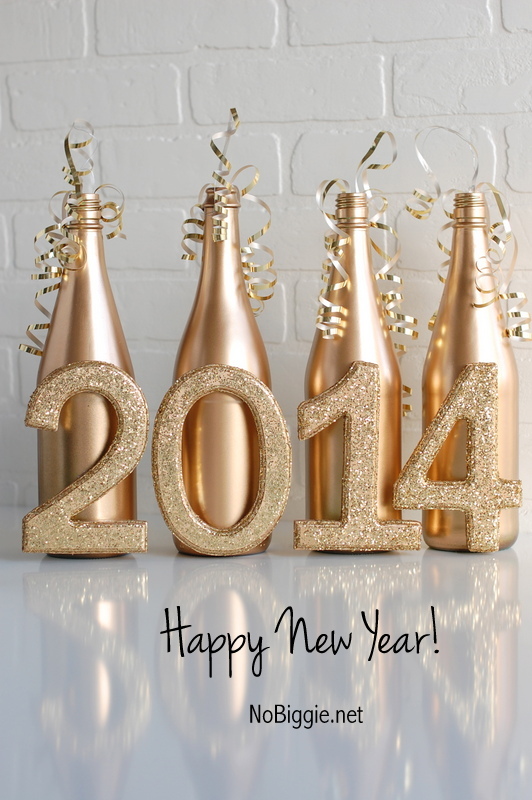 We love all the gold and glitter that comes with celebrating New Year’s Eve, don’t you?! 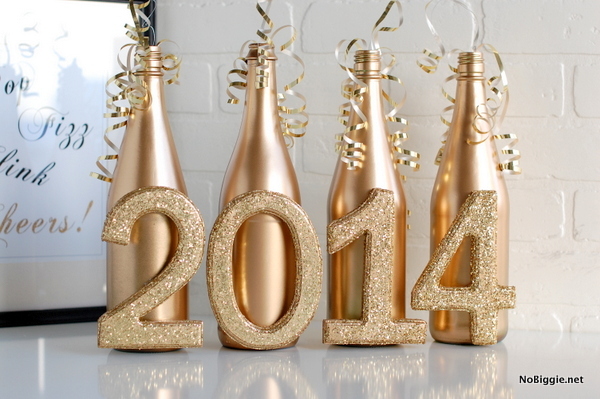 The sparkling metallic golds and silvers are such a fun color palette for a NYE celebration. Here’s the print, fun for the big night. 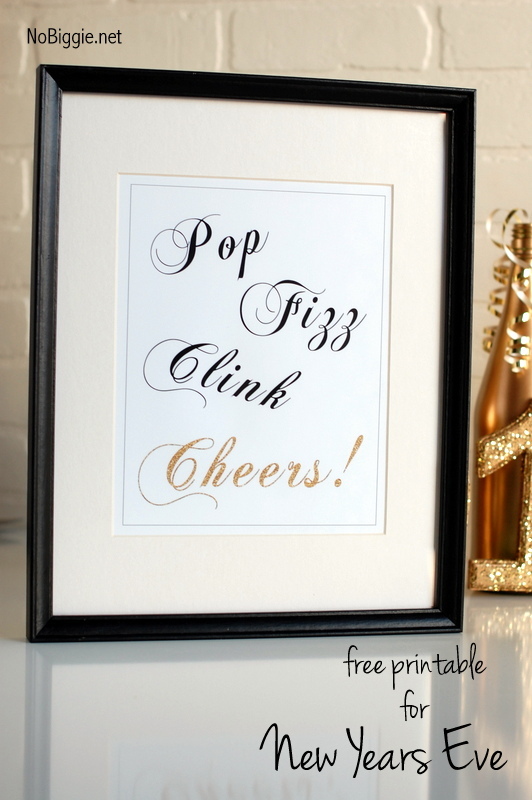 It reads: Pop- Fizz- Clink- CHEERS! It’s easy on your printer too. Just add a simple black frame and it looks great! This post is sort of a two for one. 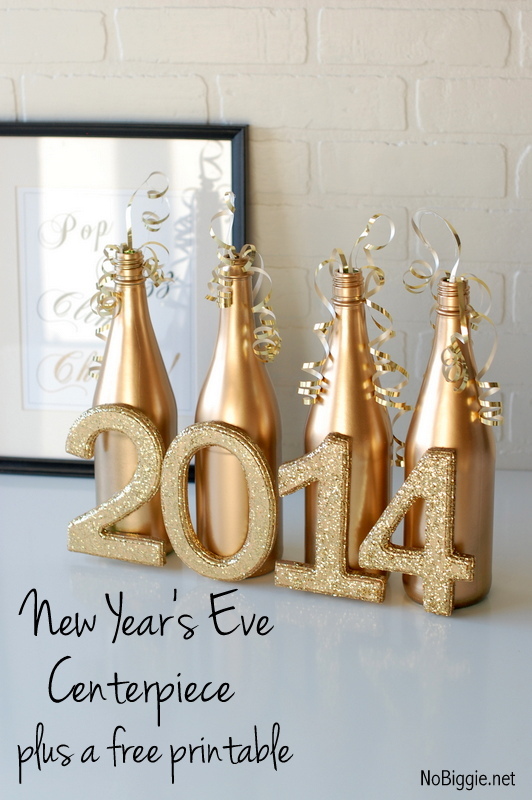 Along with this NYE printable, here’s a simple and cheap NYE centerpiece to go with it. Update: Here is the version of this NYE centerpiece for the upcoming year. 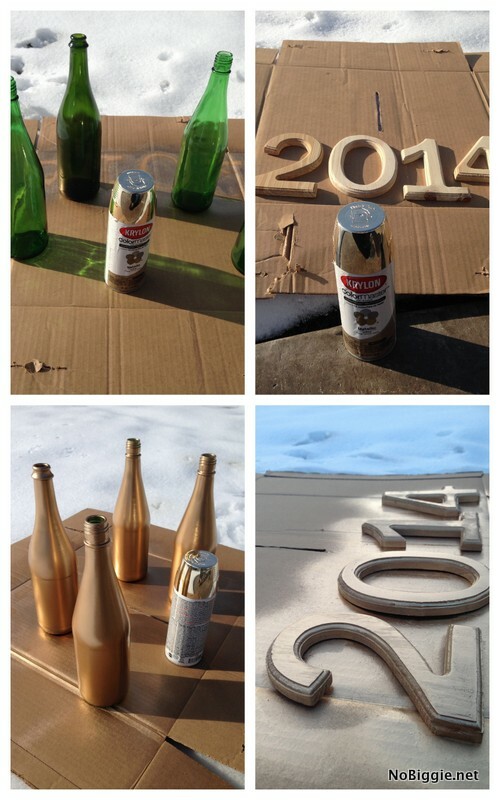 Spray paint the wood chunky numbers and the glass bottles. 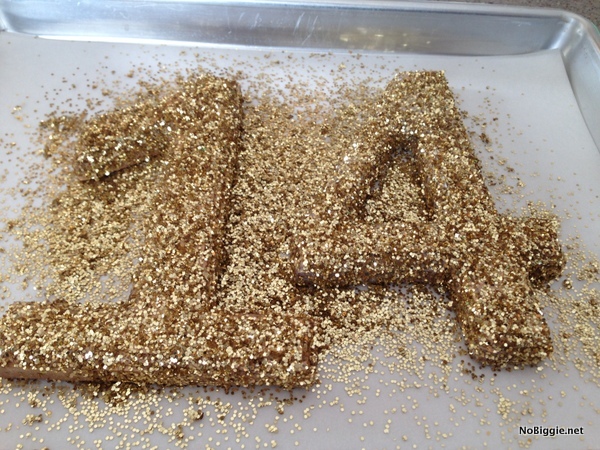 Then glitter the wooden numbers with course gold glitter. Be sure to dump the excess glitter back into the container so you can reuse any excess. Once glittered, hot glue the numbers to the bottles, and more hot glue to attach gold curling ribbon to the top inside of each bottle to look like the bubbly stuff is coming out the top, “POP!”. I love how it turned out: sparkly and golden. I wish you all a safe and fun New Year’s Eve. Here’s to an amazing year! Kam, you’ve outdone yourself!! I love it all!! Thanks Beck! Happy New Year!! Hi There! 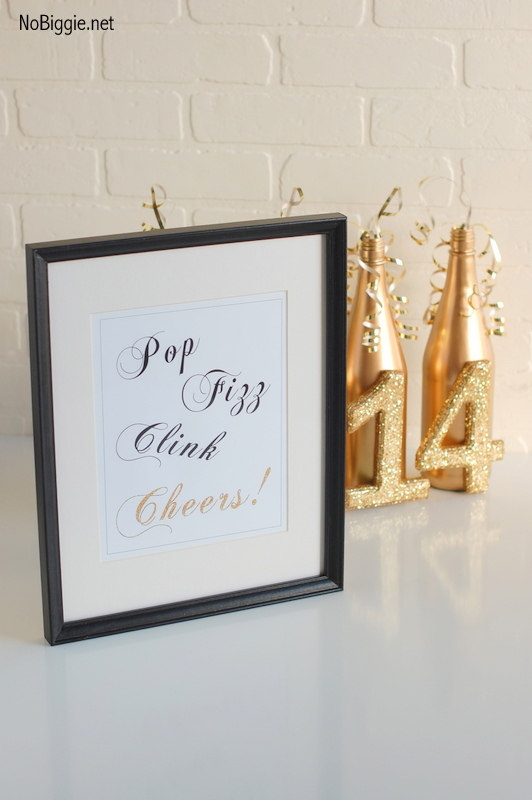 I love your new years printable Pop- Fizz- Clink- CHEERS but I can’t seem to find the link to download it…..can you help me please Thank you so much!!! Click on the “Buy Now” yellow button to purchase.